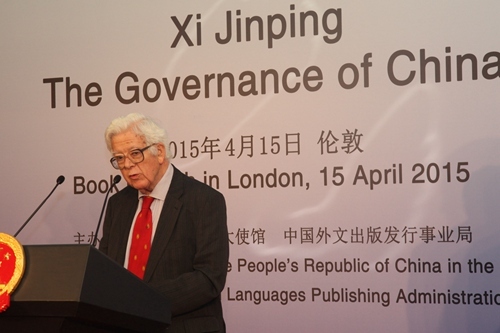 On 15 April, the Chinese Embassy in London and China Foreign Languages Publishing Administration (CFLPA) jointly held a book launch of the book Xi Jinping, The Governance of China during the London Book Fair. Nearly 150 people were present, including H.E. Ambassador Liu Xiaoming, Vice President of China Foreign Languages Publishing Administration Lu Cairong, former British Deputy Prime Minister and Foreign Secretary Lord Geoffrey Howe, former British Deputy Prime Minister Lord Prescott, Professor Peter Nolan of the University of Cambridge, Professor Martin Albrow, and guests from the British political, economic, cultural, educational and media circles. Ambassador Liu delivered a speech, in which he points out that "since the 18th National Congress of the Communist Party of China in November 2012, the new central leadership with Xi Jinping as general secretary has led the people of China on a new long march". "On this new long march, China will strive to build moderate prosperity in all respects, deepen reforms in an all-round way, advance rule of law in every aspect and strengthen the all-round governance of the Party. These new governance measures have drawn increasing international interest in how they will influence China and indeed the world. Xi Jinping, The Governance of China is a collection of works that record the President's thoughts and practices in governing China. For those who may have various questions and doubts about China, this book offers an authoritative response. For those who would like to learn more and get a better understanding of the country, this book opens a window on today's China". "Through this window, readers will be able to see where China has come, where it is going, and what kind of road the people of China will take in pursuit of development. This book has all the answers to these questions. In the book, the President expounds on the nature of the Chinese Dream. He explores China's time-honoured cultural traditions, unique historical mission and complex national condition. 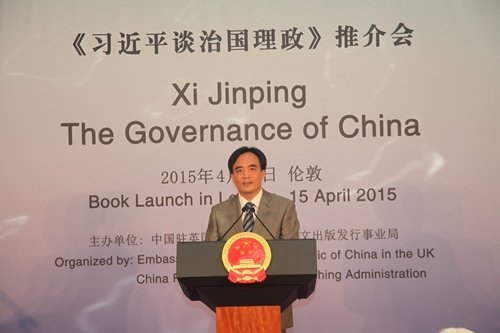 China will inevitably follow a development path that is suitable to the country. Many other thoughts of President Xi are also found in this book, including comprehensive and deeper reforms, adaptation to economic new normal, better welfare and better life for the people, stronger rule of law, cultural advancement and ecological conservation. His analysis on these important issues reveals China's complete strategic thinking, clear roadmap, coordinated action plan and strong leadership in breaking through development bottlenecks and turning the nation's vision into reality". "Through this window, readers will also be able to see China's view of the world, understand China's sense of responsibility as a member of the international community and appreciate how the Chinese Dream and the world's dream go hand in hand. From the book, readers can read about President Xi's propositions and philosophy on regional and international affairs. There are clear explanations of China's views and solutions on global issues. There are pledges and aspirations of China to share opportunities with the international community and seek common development, common progress and common prosperity". 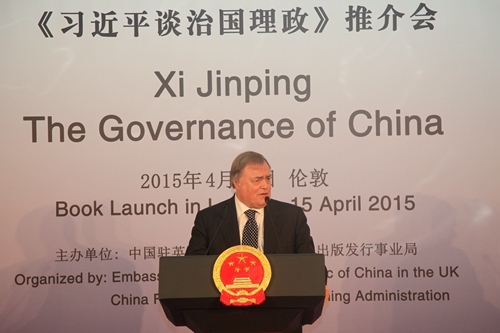 "Also through this window, readers will appreciate President Xi's wisdom, charisma and leadership style. President Xi has a literary style that is sincere, candid, unadorned and vivid. This is accredited to the many years he spent living and working at the grass roots level and going back to the roots of the Chinese culture. Readers of this book will certainly have an opportunity to appreciate the quality and charisma of a statesman in close range as well as benefit from his wisdom, his knowledge and his natural, candid and modest style". Ambassador Liu said, "As President Xi puts it, both China and the United Kingdom are major countries with global influence. Our two countries have extensive common interests and shoulder important responsibilities for world peace and development. We are now in a golden time for China-UK relationship. There have been one piece of good news after another since the beginning of this year – from the successful royal visit by the Duke of Cambridge to UK's announcement on joining AIIB, from fruitful business cooperation to flourishing events of the China-UK Year of Cultural Exchange. Now, with the launch of the book, Xi Jinping, The Governance of China here at the London Book Fair, it is one more piece of good news for people here in Britain who want to learn more about today's China. This will also certainly further strengthen the mutual understanding and trust between China and the UK". Ambassador Liu finally said that the peoples of China and the UK are all looking forward to the forthcoming state visit by President Xi Jinping to Great Britain at the invitation of Her Majesty Queen Elizabeth II. He wished the visit success in outlining a new vision and writing a new chapter for China-UK relations. Lu Cairong, Vice-President of the China Foreign Languages Publishing Administration, said that upon its launch at the Frankfurt Book Fair in October 2014, the book became a focus of widespread attention, and the response from the international community was wonderful. Over four million copies have already been sold across the world. Political leaders and renowned China experts from many countries were quick to read and review the book, and were generous in their comments. Mainstream media throughout the world have carried more than 400 reports and reviews on the book. The ongoing international attention to this book reflects the world's interest in China – a large country poised to take centre stage in world affairs. From reading this book, people from all walks of life and readers in the UK will be able to form a clearer picture of modern China. Lord Howe happily recalled his experience of witnessing the establishment of relations between China and the UK and the high-level friendly exchanges between the two countries. He hoped, by reading this book, to gain a better understanding of the important concepts and thoughts on the governance of new Chinese leaders. He sincerely wished greater progress in UK-China relations and expected the two countries to play bigger roles in the international arena. 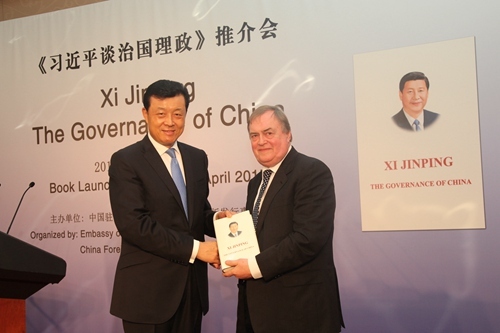 Lord Prescott said that the UK was the first western power to recognize the New China, and positive progress has been made in the bilateral relations between the two countries since the establishment of diplomatic relations at the ambassadorial level between the UK and China in 1972. 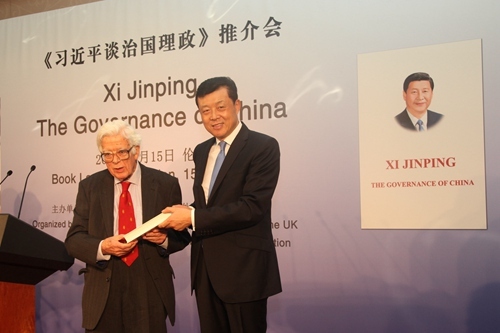 The book, Xi Jinping, The Governance of China is now launched in the UK and the timing is perfect. It will help the British public better understand the governance philosophy and concepts of new Chinese leaders and gain a deeper understanding of socialism with Chinese characteristics. Profound changes are now taking place in the international landscape. The UK and China should join hands to face the global challenges in reforming the global financial system and addressing climate change, and work together to contribute to a global consensus. Professor Nolan noted in his address that the governance of China will not only shape China's future, but also exert positive and profound impacts on global governance. This is the value of this book. China's development path and development pattern introduced by President Xi in the book reveals the strategic thinking of the new generation of Chinese leaders on a series of major issues, such as balancing the relations between the government and the market, breaking the economic bottleneck, tackling challenges in development and deepening the economic reform. Xi Jinping, The Governance of China is a showcase of the historical accumulation and extraordinary wisdom of the Chinese civilization, indicating that China will continue make positive contributions to the harmony, stability and development of the world. 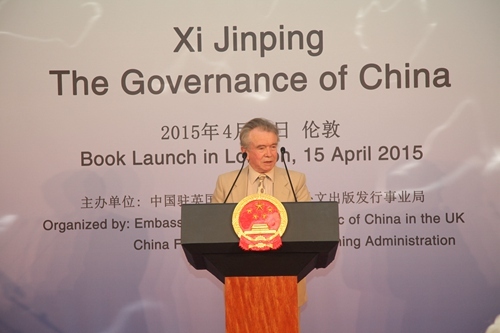 Professor Albrow noted that Xi Jinping, The Governance of China will exert a profound impact on China and the world in the 21st Century. By drawing wisdom from China's ancient history and splendid civilisation, President Xi puts forward important thoughts and a theoretical system on how to govern the modern society. With today's world facing common challenges of peace, cooperation and development, the philosophy and wisdom from the East will serve as an important enlightenment for countries around the world on how to deepen cooperation and strengthen global governance. At the book launch, H.E. Ambassador Liu presented copies of the book to Lord Howe and other guests. 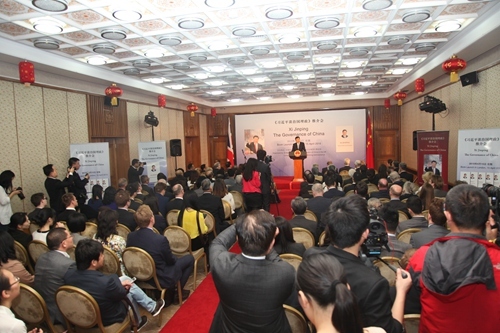 Journalists from more than 30 domestic and foreign media agencies were present and covered the launch, including the Financial Times, the BBC, the Reuters, the Sunday Telegraph, Sky News, the People's Daily, Xinhua News Agency, CCTV, China Radio International, China News Service, China Daily, Sing Tao Daily, the UK Chinese Journal and Nouvelles d'Europe. Founded in 1971, the London Book Fair is the most important spring gathering and one of the most influential trade fairs for the publishing industry the world over. 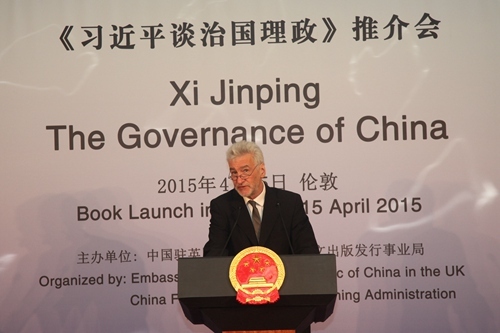 As a major highlight at the Book Fair, the launch of Xi Jinping, The Governance of China received wide attention and acclaim from the international publishing industry and readers from various countries.